Scrum Masters and Agile Coaches are responsible for maturing their groups of people into high performing teams. That also means highly collaborative, confident, self-organizing, mutually supportive, high morale teams with a dedication to continuous improvement; teams that are willing to innovate and take chances while also being responsible for their commitments, to each other and their customer. That’s a lot! And it’s great when it “all comes together.” But what about when it doesn’t? Agile and the Scrum framework provide the opportunity for high performing teams to emerge and operate, but they don’t by themselves guarantee that this will happen. Good, smart people can require assistance to mature and thrive as Agile team members. As W. Edward Deming said, “The individual has been crushed by our style of management today.” Sometimes the person needs some help digging out. This being true, we see that knowing and administering the mechanics of the Scrum ceremonies is the very least of what a Scrum Master must be able to do. But when it comes to helping an entire team in various stages of dysfunctionality mature to a high level of productive collaboration, exactly what skills are required? We find ourselves looking at a skill that is in no way specific to Scrum or Agile, but also requires a servant leader mindset in order to do execute it well. We’re talking about the overall skill of facilitation. Facilitation does not mean “solving a problem” or “doing it for someone”. It means doing something that makes a process, like dialogue, run a little better and smoother. Facilitators act as process leaders: they don’t have the sole decision-making authority, nor do they contribute to the substance of the discussion. 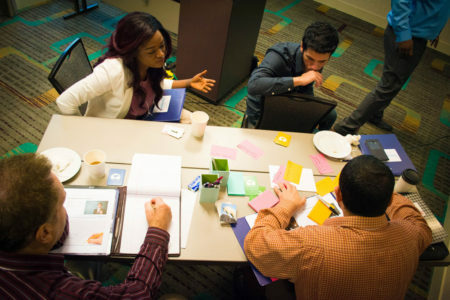 The facilitator’s aim is to lead the group process; to help the group to improve the way they communicate, examine and solve problems, and be more self-reflective. One key part of the facilitator role is to make the process explicit and so promote the awareness of dialogue. But wait you say – that’s what a Scrum Master is supposed to do! Interesting isn’t it? Knowing the mechanics of Scrum falls into the “Scrum is Easy” part. Leading by example with an Agile mindset and using facilitation skills to help your teams learn to actually collaborate well, means helping them with the “Doing Scrum is Hard” part. Which is where they really need you. Be a great Scrum Master or Coach. If you don’t already have them, acquire the skills to effectively facilitate Agile teams. The satisfaction you get from seeing your teams reach higher levels of communication and collaborative production will be its own reward. In upcoming blogs, we’ll take a look at some specific facilitator techniques and a few things an Agile team facilitator should know. We’ll also look at how facilitation compares and integrates with coaching, mentoring, and training.